The refreshed version incorporates a user interface that looks more like the Home page of other iOS products, with app-like buttons for Movies, TV Shows, Music, Computers, Settings, and support for existing features such as Netflix, MLB, NBA and NHL. "People are going to love streaming movies and TV shows in 1080p with the new Apple TV, and photos look beautiful displayed at the maximum resolution of your TV," said Philip Schiller, Apples senior vice president of Worldwide Marketing. "Apple TV is easier than ever to use with its new icon-based interface and the ability to access your purchased movies, TV shows and music right from iCloud." Owners of the second-generation Apple TV will be able to access the new user interface with a free software update scheduled to become available today. 1080p video playback will remain exclusive to the new Apple TV. 1080p programming available for the Apple TV will include iTunes movies and TV shows, Netflix, Vimeo, photos and more. And with an updated iTunes in the Cloud, customers will be able to play movies and TV shows bought on the iTunes Store instantly on their Apple TV. The Apple TV also recommends movies for users based on their viewing habits. With a long-press of the menu button, users can go back to the home screen quickly. 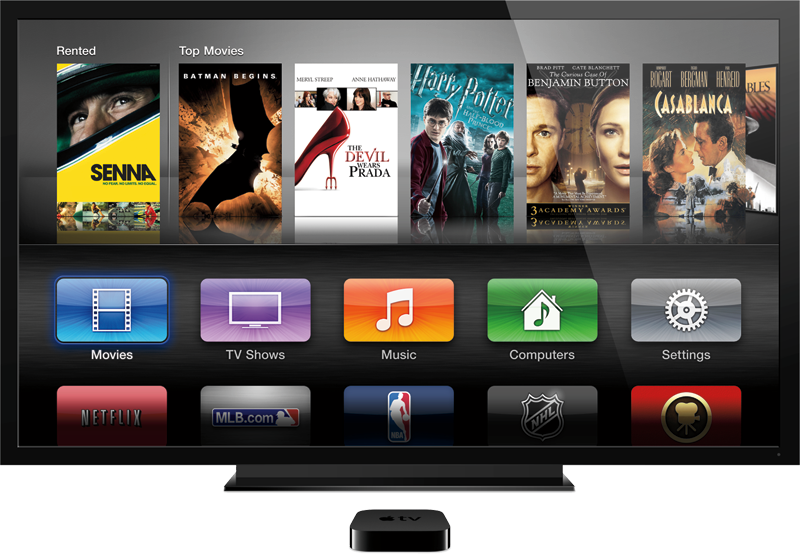 Apple TV users will be able to choose from over 15,000 movies and more than 90,000 TV episodes on the iTunes Store. The new Apple TV will be available for $99 and will go on sale next week. It can be ordered starting today, and will require iTunes 10.5 or later.